Image used courtesy of the estate of Lee Snider. AIDS devastated a generation and continues to have an impact on communities dealing with the crisis. But it has also become the focus of insistent, resilient writing and work that inspires countless other advocates. 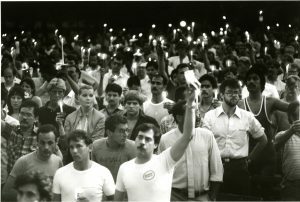 Join PEN America on June 22 as we hear from poets, storytellers, and performers to mark an historic occasion—the first Pride in New York City with public space dedicated specifically to AIDS remembrance. The AIDS Memorial, located in a public park adjacent to the former St. Vincent’s Hospital, honors the more than 100,000 individuals lost to AIDS in NYC alone, as well as the many activists who ignited and have maintained a global response. We will be filling the space with words from noted literary figures, emerging writers, and other individuals who have been indispensable in carrying forward the stories of the movement. Our growing lineup includes Kate Bornstein, Mark Doty, Timothy DuWhite, Jean-Claude van Itallie, Rickey Laurentiis, Jaime Manrique, Ethelbert Miller, sam sax, Sarah Schulman, and Jean Valentine sharing their own work, as well as tributes to Reinaldo Arenas, Tory Dent, Melvin Dixon, Tim Dlugos, Essex Hemphill, Arthur Russell, David Wojnarowicz, and others. Our partners (so far) include: ACT UP, the NYC AIDS Memorial, the Fales Library, Housing Works, Visual AIDS, and Treatment Action Group. This event is free and open to all. Registration is encouraged but not required.